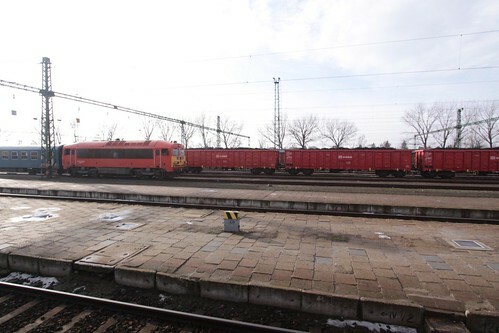 The train departed Budapest Keleti pályaudvar, with a CFR Class 47 electric locomotive hauling the service jointly operated by CFR (Căile Ferate Române) and MÁV (Hungarian State Railways). 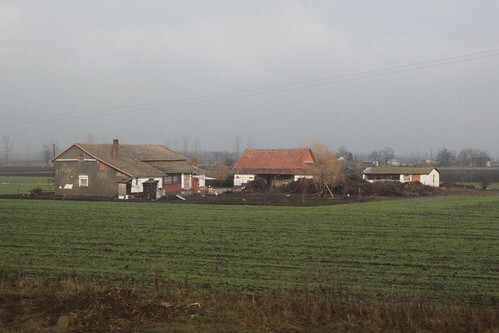 As we travelled south-west across Hungary, a grey mist covered the countryside. The stations were very frequent. 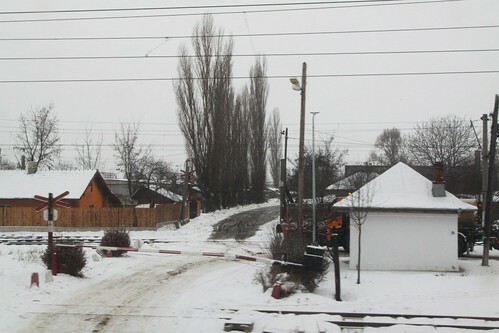 And along the way, we passed suburban trains stopping at the smaller stations. The weather didn’t get any better. 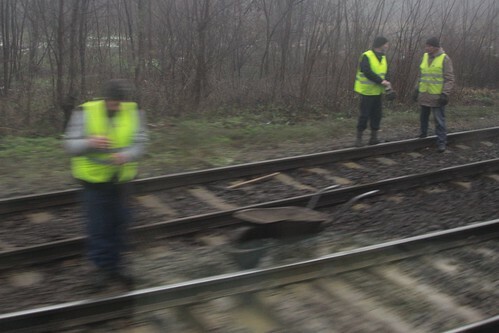 At least for the trackworkers, their high-vis vests stood out. 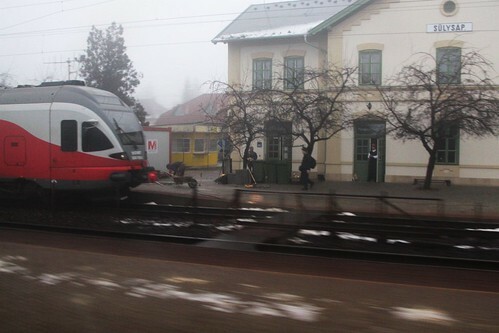 At bigger cities like Mezőtúr we stopped for passengers. 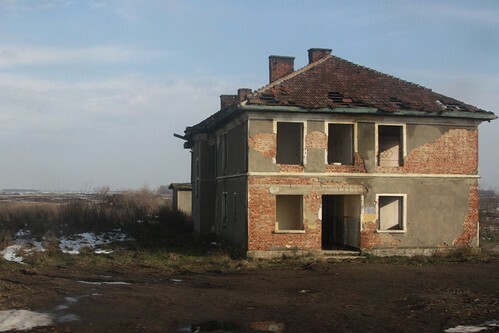 But eventually the cities gave way to farm houses. 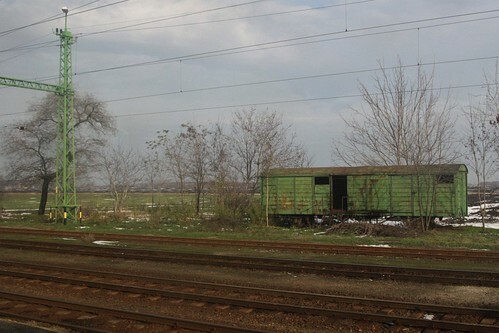 As well as open countryside. 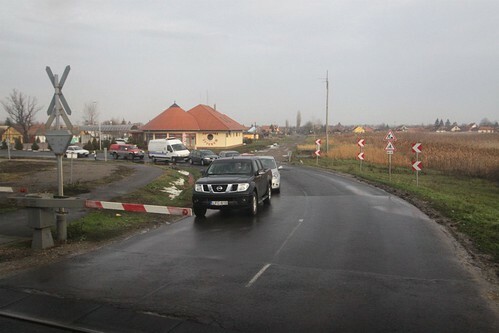 In the larger towns there were long queues of cars at level crossings, waiting for our train to pass. 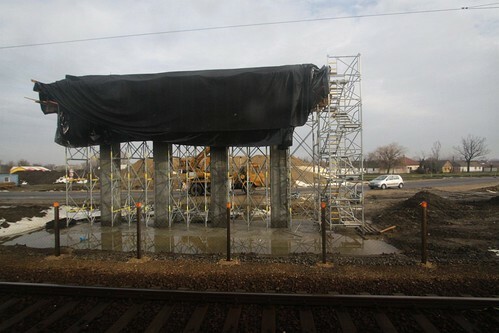 But a number of grade separation projects are underway. 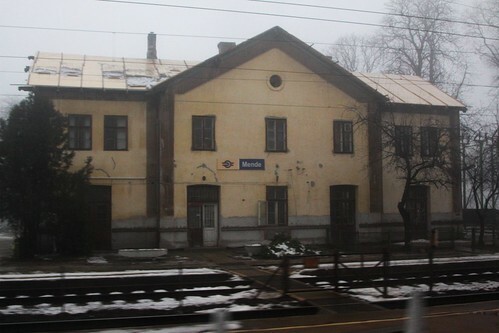 The city of Békéscsaba was our final stop in Hungary. 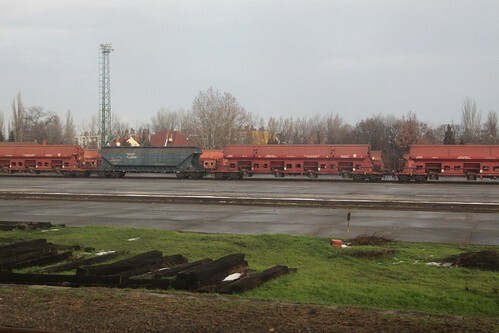 A number of coal and passengers trains were stabled in the yard. 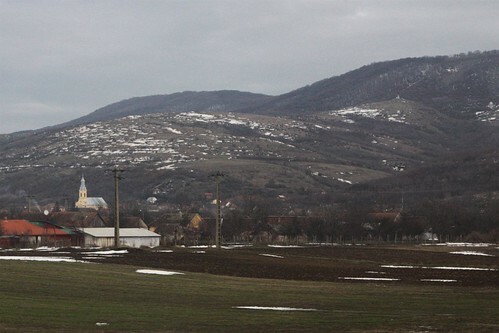 As we continued towards the border with Romania, the sun started to come out from behind the clouds. 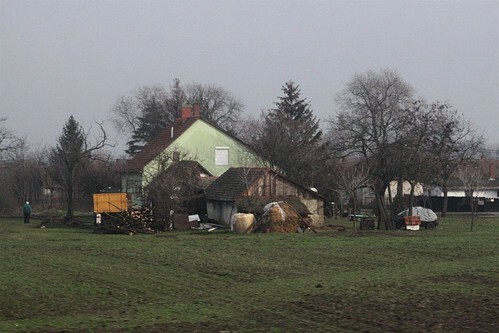 With the grey mist replaced by green grass. 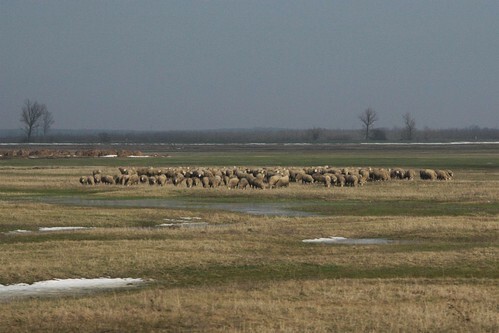 With sheep grazing out on the open plains. 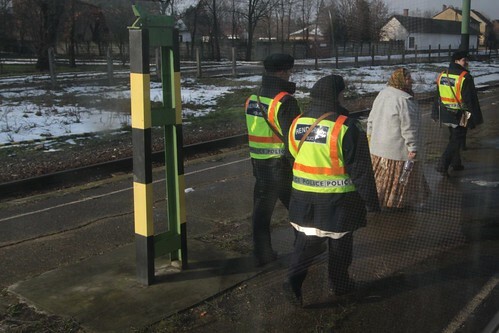 We eventually rolled into the station at Lőkösháza, which is the checkpoint for the Hungarian side of the border. 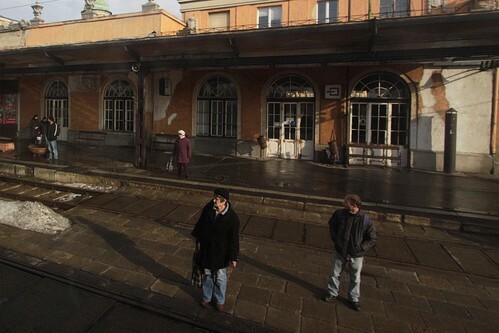 After having our travel documents checked, the train was clear to head out of Hungary. 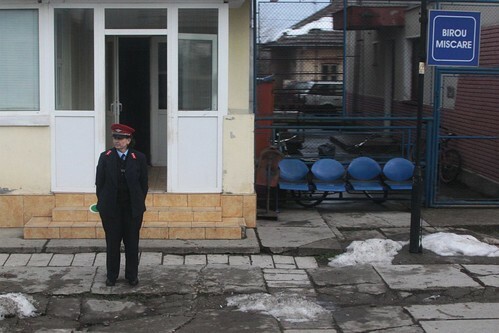 We then stopped at Curtici on the Romanian side, so that their border staff could complete the same checks. 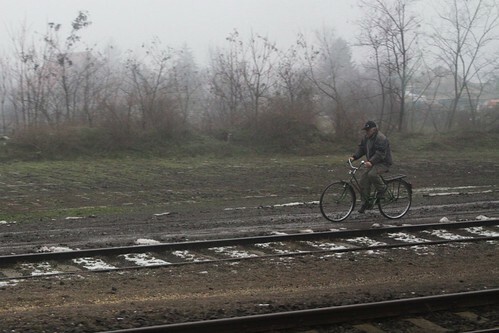 On crossing into Romania, everything seemed to be falling apart. 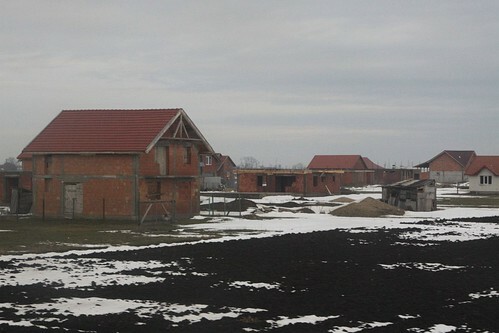 There were new buildings taking shape, but all looked to be unfinished and in a state of abandonment. 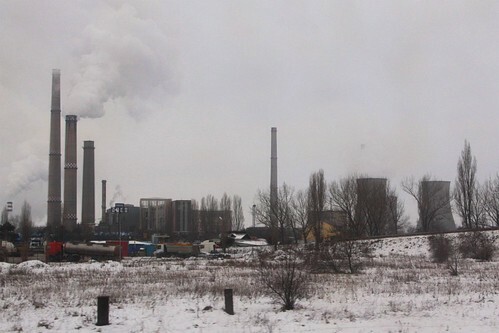 The first Romanian city we passed through was Arad, which welcomed us with a massive coal fired power station. 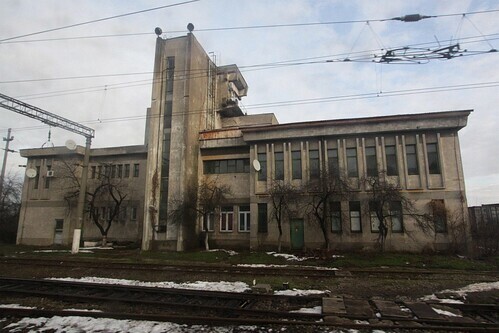 The crumbling concrete railway offices didn’t exactly roll out the welcome mat either. 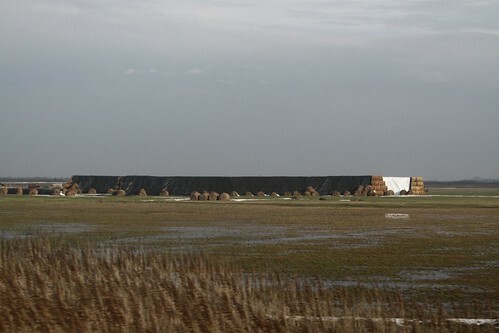 As we continued west the countryside became more scenic, the open plains gave way to rolling hills. 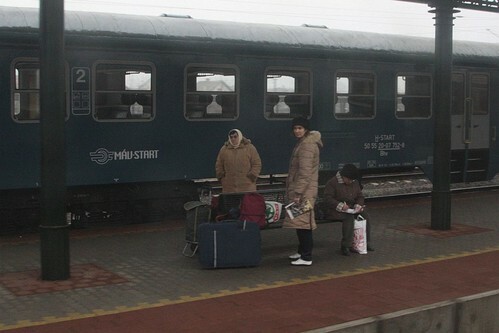 Our train sped through dozens of sleepy looking railway stations. 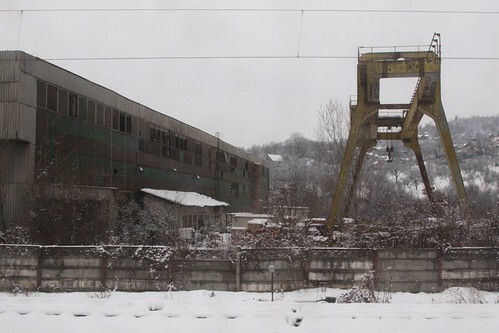 As we headed up into the mountains, the railway paralleled a major highway. 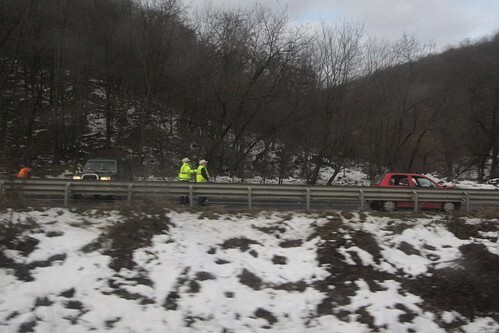 Where a car crash had shut down the route, with drivers abandoning their vehicles. 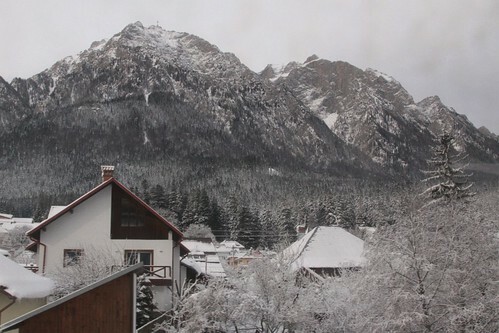 As the elevation increased, so did the snow cover. But night soon fell, with the last few hours of the journey being in the dark. 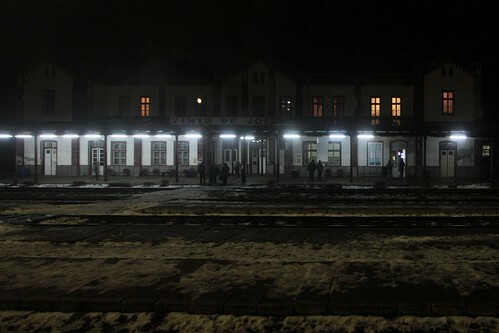 We finally arrived into Brașov station at 11 pm, and headed for our hotel. 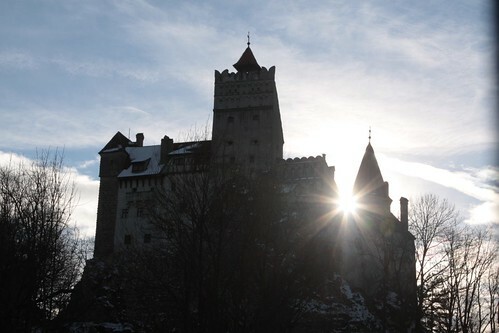 After a side trip to Bran Castle and two nights spent in a hotel above the train station, it was time to depart Brașov. 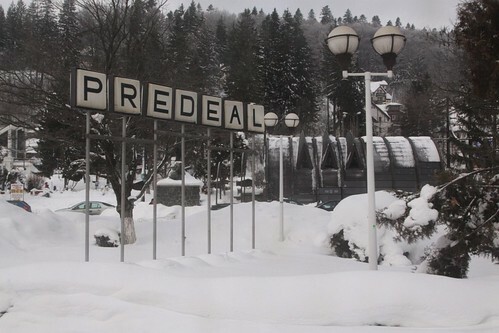 The train headed up into the mountains, passing resort towns such as Predeal. We were down in a valley, with the Bucegi Mountains towering above. 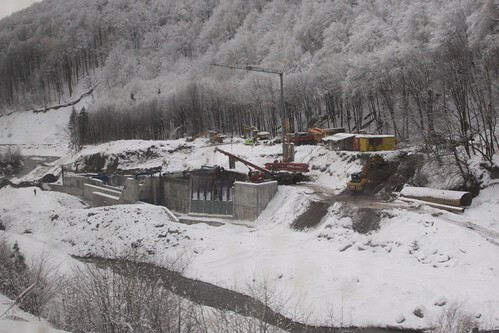 We crossed ice covered rivers a number of times, where there seemed to be a lot of construction work going on. 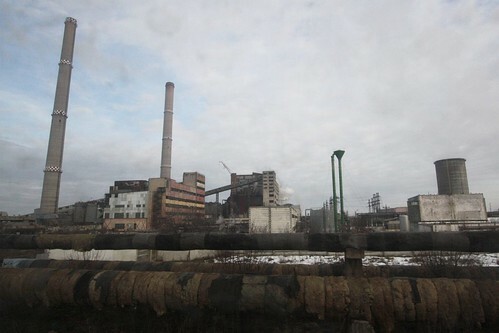 As we left the mountains, factories became more common. 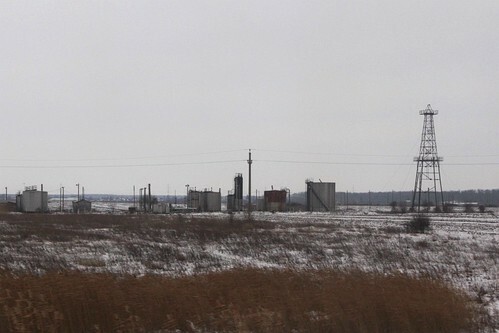 With power stations and smokestacks dominating the scenery. 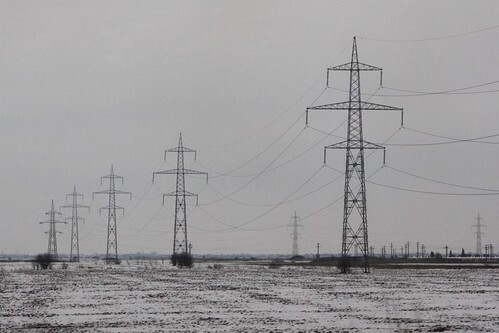 Eventually we reached the plains. 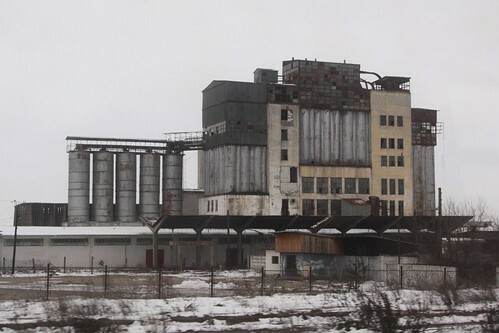 Silos and flour mills indicate that grain is an important crop in Romania. But there wasn’t much else to see. 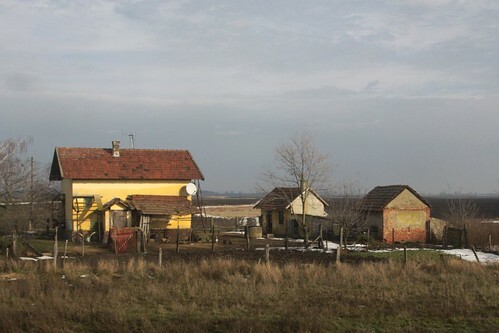 Eventually we entered the suburbs of Bucharest. Grey concrete apartment began to dominate the view out the window. 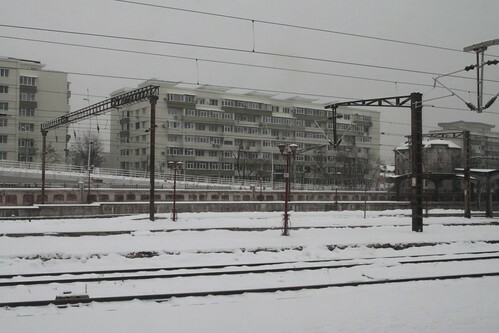 Until we reached Gara de Nord station in Bucharest, where our train terminated. 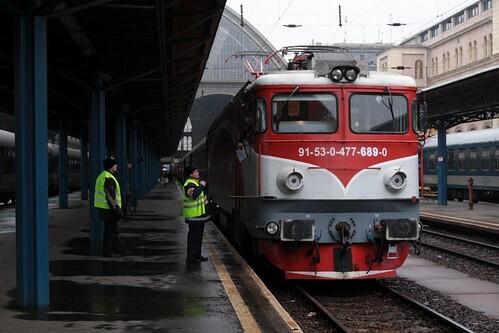 Note the CFR Class 47 electric locomotive up the front – it was swapped with the original diesel locomotive during the station stop at Brasov. 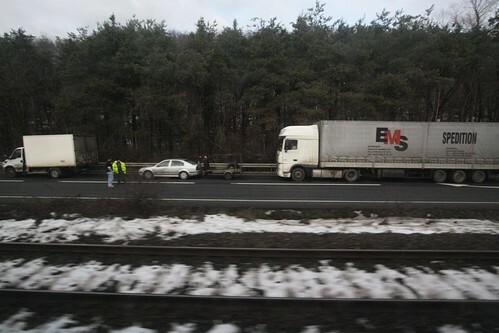 For the entire journey I had my GPS datalogger running – the resulting track can be found below. 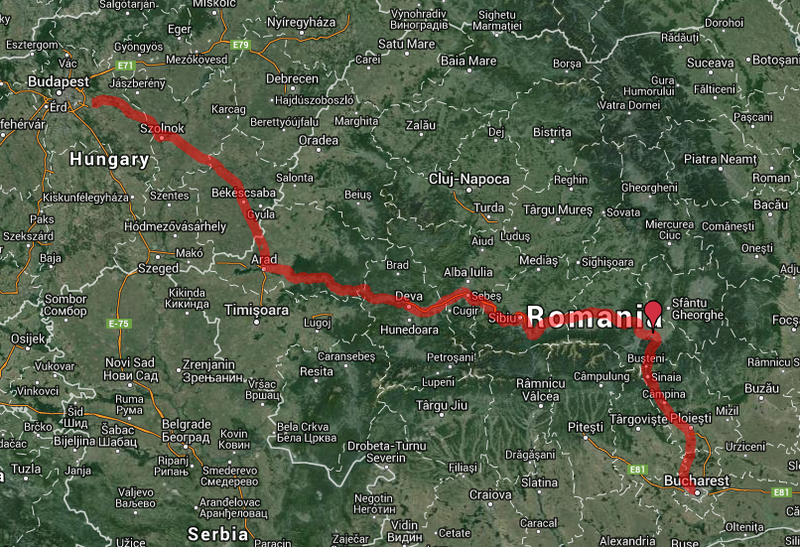 The red marker indicates our pit stop in Brașov. 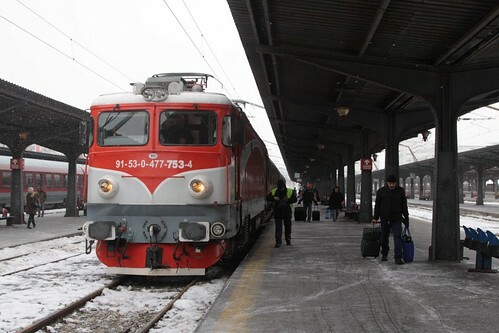 The Man in Seat 61 has more details of the trains that run between Budapest and Bucharest. 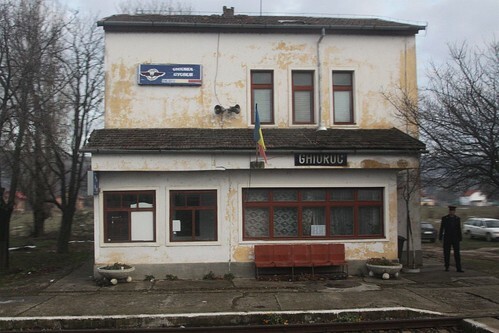 This entry was posted in Trains and tagged Brasov, Bucharest, Budapest, Căile Ferate Române, CFR Călători, Hungarian State Railways, Hungary, Magyar Államvasutak, MÁV, Romania, travel journal. Bookmark the permalink.